As much as I love brunch, I have high expectations for it. I do not simply want to pop in somewhere, grab a quick bite and leave, no no - I want the whole enchilada. Delicious food, incredible ambiance, and good service. Granted these are things people strive for in any meal they're going out to have, but brunch in particular needs to meet these requirements as it's a rarer occasion than a quick lunch with a friend or a morning coffee run. 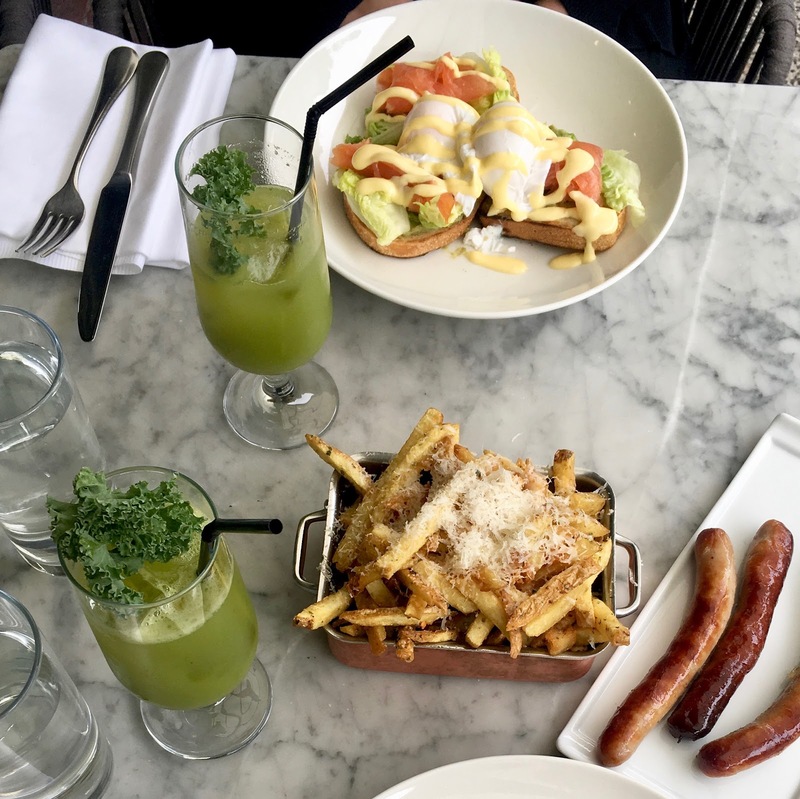 So, my lovely readers, I, Alyse Allain, brunch enthusiast and queen of eggs benedict, have conjured up my list of my favorite brunch spots in the whole of Dublin (with ratings and favorites included!) and I guarantee that if you try one you will not be disappointed! Sophie's is located at the top of the Dean Hotel, which in itself is worth a visit, but Sophie's is definitely its crown jewel. The atmosphere is fun and lively, the views of Dublin are spectacular, and the food is....good. It's honestly nothing life changing but it's good! I've never had anything bad but I've also never had anything that made my eyes roll into the back of my head. The reason to go here isn't for the culinary experience, it's for the atmosphere. A great place to meet with a larger group of friends! Herbstreet ★★★★ Favorite: Eggs Florentine This place is always packed, but for a good reason - the food is amaaaaazing. The atmosphere is also lovely - it's situated right on Grand Canal Dock so it overlooks the water and a main walkway, making it excellent for people watching. Herbstreet is also an eco-friendly restaurant that has a commitment to keep a light carbon footprint - love that. I only took off a star because getting a table here can be a nightmare, especially on the weekends because they don't take reservations! Your best bet is either to go right when they open or right before closing. WUFF ★★★★ Favorite: Eggs Benedict with crispy bacon / Caesar chips / Warm sweet waffle If I had to put these recommendations in order, WUFF would win the #2 spot (don't worry, I reveal #1 later!) I've never had anything here that I thought was just "good" - everything is delicious. Definitely a place to indulge! I only took off a star because the atmosphere doesn't meet my high expectations - it's cute, but it's nothing special. Note: WUFF doesn't have an Instagram (weird) so I shared this picture from @yummydublin - she is a champion eater on the Dublin scene and seems to always know the best places to eat, definitely check her out! Wanderlust ★★★★ Favorite: French toast with crispy bacon Alright so, this place isn't exactly in Dublin - it's in a little village called Dalkey right outside of the city center, but it's quick & easy to reach by train so I felt the need to include it in my list. Truthfully, I was originally drawn to this place because I love the word 'wanderlust', but I go back because of another word - bacon. Jesus have mercy on my soul, their bacon is out of this world. I don't know where they get it or how they cook it but it. is. divine. The atmosphere is nice but lacking (a place called 'Wanderlust' has potential to have amazing decor and they do not use it to their advantage) but the town of Dalkey is the most adorable place ever, so a quick trip down to Wanderlust followed by a walk through the town (or a hike up through Vico Road) makes for a lovely Sunday. Le Drunch @ The Marker ★★★ Favorite: Belgium Chicken & Waffles This place is violently overpriced and the servings are small, but it's also sooooo delicious. The service & atmosphere are amazing (the views of Dublin are unparalleled to any other restaurant) but it's not necessarily somewhere comfortable to visit. The Marker Hotel is very swanky so the people who go here are too (you'll see Dublin's elite with their head to toe designer ensemble at 11am) so if you're ok with somewhere a little pricier where you can't rock up wearing jeans and a tee, this would be my pick. This is a fun place where you can get down and dirty (think opposite of Le Drunch @ The Marker). The portions are massive, the grub is greasy, and the drinks are flowing right when they open. However, the atmosphere is not that of a greasy food joint - it's playful and sophisticated. They have an outdoor patio/beer garden, multiple neon light installations, and loads of colorful art all around that bring it to life. It's also located in Blackrock, which (similar to Dalkey) is a lovely place to have a stroll on a Sunday. Angelina's ★★★★★ Favorite: Eggs Angelina / Vanilla buttermilk pancakes / Apple, ginger & kale juice Drumroll please....! This establishment wins my #1 favorite brunch spot in the entirety of Dublin. It matches my 3 requirements perfectly - the food is unreal, the atmosphere is the perfect mixture of beautiful and casual, and the service has never failed me. This gem is located right on the canal, so they have a gorgeous terrace where you can enjoy your pancakes and the water simultaneously (blankets and overhang included in case of rain!) but if you're more of am indoor eater, the interior is very cozy and luscious with lots of cool lighting and greenery. Definitely book ahead, but the space is big so it never feels crowded even if you do a walk-in. All in all, I could not recommend this place more. Pot Bellied Pig ★★★★★ Update: April 2018 Favorite: Eggs Benedict with Pulled Ham Finally, almost a year later I have a NEW firm favorite brunch spot! This place is EVERYTHING, it's totally dreamy and pink and fun and the food (& coffee!) is spectacular. They also host a drag brunch that I am dying to go to. If this place was closer to my house I'd go every weekend! No reservations so make sure to get there early! There are LOADS more brunch spots in Dublin - some I've tried (and hated) and others I have yet to explore! So I'll make sure to keep adding to this list when I find new gems. And please, if you have a brunch recommendation for me please let me know in the comments below!